With Remembrance Day this Wednesday, I’d like to recommend a book for any parents out there looking for a story to give a bit of context to a soldier’s experience in a way a child can understand. 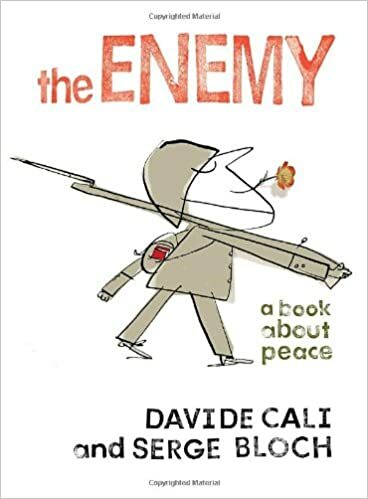 The Enemy (a book about peace) by Davide Cali and Serge Bloch is a charming and deceivingly simple picture book about a soldier’s feelings toward his enemy and how we must differentiate ourselves from our enemy in order to participate in war. The main character spends the duration of the book in a trench, wondering about the enemy, who is camped out in the trench across the field. He describes the enemy as inhuman, not possessing the emotion nor the capacity for love that he himself possesses. He describes how the enemy would kill him in cold blood if given the chance. By the end of the book, we learn, of course, that the enemy is just like our hero, and likely thinking exactly the same things about him. As simple as it is, I found this book very touching and I love how it addresses the underlying humanity of war. I got our copy from the Calgary Public Library, but given that Remembrance Day is in two days, you may not be able to get it from the library or bookstore in time. In that case, try this reading. The sound is not awesome but I think it will still be enjoyable for kids. ← Hey Guys! Did You Know…? 6 am Is An Actual Time!